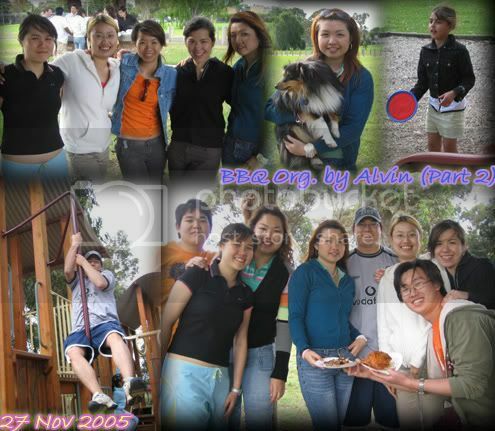 ~*~ Juz Mel: Part & Parcels of Life ~*~: eXAm ReSuLtS oUT, 13 DeCeMbER GrADuAtiON iS oN, a LiTtLE eFForT gOeS a LoNG wAY & dA BBQ LaST SuNDaY! 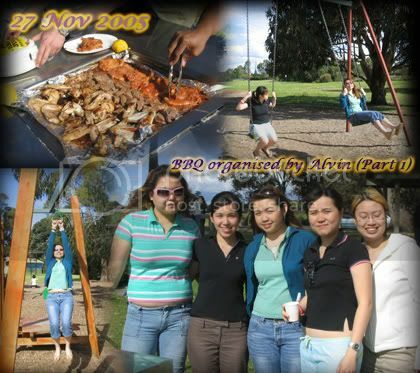 eXAm ReSuLtS oUT, 13 DeCeMbER GrADuAtiON iS oN, a LiTtLE eFForT gOeS a LoNG wAY & dA BBQ LaST SuNDaY! WooHoo! Exam results have been released earlier by one day, as usual. And I got mine through SMS about 6pm plus. Don't know why I didn't have too much worries about it, although I know being over confident isn't a good thing. But I guess I still DID IT, thanks to the support from my wonderful parents, darling and most of all I Thank God too! Was really surprised when my honours head told me a couple of days ago that my thesis results will be release together with the examination results and I didn't believe it.... till now! Yeah, it's only a D, I couldn't ask for more with the effort I had put in. Was hoping for 1st Class Honours, but being the lazy bum me and 3 HDs, 2 Ds for the whole Honours term should still get me a 2nd Class Honours, Division A I hope... Oh yah thanks to all my chabohs who have been giving constant support and also Tigger who told me everything will turn out fine! Love you all heaps! *muaks* Now I can look forward to seeing Mummy and Daddy next week when they arrive in Melbourne for my 13 December Graduation! Congrats to all of us who will be graduating in this december ceremony. Those whose turn have not yet come, don't worry, study hard and it will come soon! Darling's results wasn't what he had expected and he's pretty upset about it. Guess his PC games and television will have to go next year as I really hope he can do better. 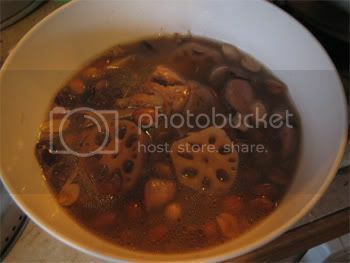 Decided to make Lotus Root and Peanuts with Chicken soup today and lucky I did, so that at least eating something he likes made him feel better, even if just a little bit. We also found out that Carine couldn't get a job she wanted to stay on here, so she's returning to SG. What a pity, a girl who knows how to appreciate the life in Melbourne yet not given the chance. I reckon if she had spent more time studyin here, she could apply for PR like us.. Wish her all the best anyway, back in SG. :) Then there were people walking their "SO CUTE" doggies where I couldn't help but take a shot with one of them. Yeah he's lookin at the food! Later on came this cute little girl who dugged out her toy bag and asked us to play with her! She's really pretty. Then you can see darling climbing down the "Firemen's" pole where he tried very hard to convince Len to give it a go as well, but she wouldn't. Well, the great big hurdle's finally passed now, but somehow there still isn't a total sense of relief, I don't know why. Oh well, at the moment, we shall all enjoy ourselves to the fullest first and worry about other things later!